Many of our dogs' common behavior problems are caused by boredom. When your dog gets bored, he begins to look for ways to entertain himself. This leads to inappropriate chewing, excessive barking, and digging. While training can help with some of these problems, there are several other things you can do to curb your dog's destructive behavior. If your dog is being destructive, chances are he's looking for a way to burn off energy and bust boredom. What better way to burn energy than exercise? 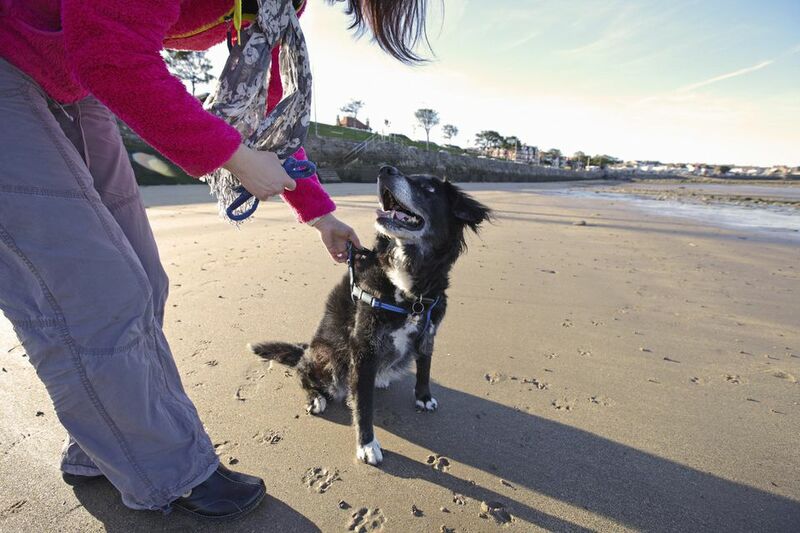 There are a number of ways to add exercise to your dog's daily routine. It can be as simple as a walk around the neighborhood or a game of fetch in the backyard. High energy dogs may need something more. Border Collies, pit bulls, and other high energy dogs may do well with running for exercise or getting involved in a dog sport, such as agility. Giving your dog something interesting to play with is another way to keep boredom at bay. Try out different toys to see which ones appeal to your dog most. It's also important that toys hold their interest for a little while. Most dog trainers recommend toys that are fun and also offer dogs a mental challenge. There are a number of food-dispensing toys that fit the bill. Toys such as Kongs or Buster Cubes work great. A Kong can be stuffed with some of your dog's favorite treats or food, and your dog then works to get the food out. Buster Cubes are similar in that you can fill them with food or treats. Your dog has to push them around to get the toy to dispense the food. For dogs who like to chew, dog bones may keep them entertained for awhile. Just be careful about the bones you choose for your dog. Bones have been linked to a number of health problems, including intestinal blockages, tooth fractures, and stomach irritation. Talk to your veterinarian about the safest bones for your dog. One way to keep things interesting for your dog is to rotate his toys. Every few days, pick up a few of his toys and add a few new ones. By rotating toys, you keep things constantly new and interesting. Training gives your dog's brain a workout and alleviates boredom. Add a few short training sessions to your dog's daily routine. Two or three 10-minute sessions should do the trick. Keep things fun and upbeat while you teach your dog new commands. Clicker training or other positive reinforcement training is a great way to keep things fun and rewarding for your pet. You will be amazed at how much mental energy your dog can burn simply by adding a few training sessions to your day. Playing with other dogs is a great way to give your dog exercise and relieve boredom. You can see if any of the dog owners in your neighborhood want to plan play dates for your dogs, or you can find out if you have a dog park near your home. Dogs benefit greatly from playing and socializing with other dogs. Just be sure that your dog and the dogs he plays with are up-to-date on vaccinations. Training classes combine mental and physical activity. If you haven't checked out any of your local training facilities, you may be surprised by all the different classes they offer. There are classes in puppy manners, basic and advanced obedience, dog sports, pet therapy and Canine Good Citizen preparation, breed handling, tricks, clicker training, and more. Many training facilities also offer drop-in classes which allow you to train on a schedule that works for you. Many times destructive behavior takes place when you're not home. This may be due to separation anxiety, but more often it is the result of boredom. If you leave your dog alone for more than 4 or 5 hours each day, he may be bored and trying to entertain himself by chewing on your furniture or barking in hopes of getting some attention. A great solution to this problem is finding a doggie daycare or hiring a dog walker. Doggie daycare allows you to leave your dog in a safe place where he gets lots of attention and playtime, as well as the chance to socialize with other dogs. A reputable doggie daycare facility is a great alternative to leaving your dog home alone while you're at work. A dog walker is another option. This is someone who comes to your home to give your dog some playtime and exercise each day. It cuts down on the time your dog is left home alone and prevents him from becoming bored enough to start gnawing on the table legs. With either doggie daycare or a dog walker, ask for references. It's important that the people caring for your dog are experienced pet professionals. If you aren't sure where to find a dog walker or doggie daycare, ask your veterinarian or local humane society for a recommendation.